"It is part of our DNA, our culture. It is the way we live and we feel for soccer," said Cantor about his iconic soccer call. There's very few people who can say they're known worldwide for their exuberant sports calls. 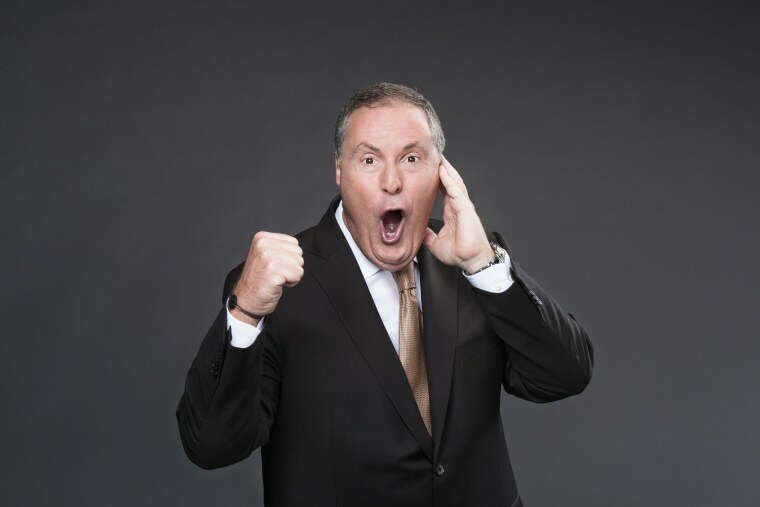 But who hasn't heard the prolonged, instantly recognizable "GOOOAL" of award-winning soccer sportscaster Andrés Cantor? "It is part of our DNA, our culture. It is the way we live and we feel for soccer," said Cantor about his signature call, which has become synonymous with soccer fans' passion for the sport. Cantor has shouted "GOOOAL" in thousands of matches over the past thirty years. "I never imagined that it would transcend barriers and break into the general market and the mainstream and become what it has become," he said. "I'm happy not for myself but for helping, back in 1994, to popularize the world of soccer." The five-time Emmy award winning sportscaster spoke to NBC News ahead of the start of the much-anticipated global event, the 2018 World Cup, which begins on Thursday, June 14 and will take place in Moscow. Cantor will be the lead commentator and anchor for Telemundo’s exclusive Spanish-language coverage of the event. This will be Cantor's tenth World Cup and his 8th as a play-by-play announcer, a milestone achievement in a long career. Before joining Telemundo in 2000, Cantor landed his first job as a sportscaster in Univision back in 1987. "I was 23 when I was given the responsibility of calling every single soccer game for Univision," said Cantor while reflecting on this long, successful career. "I've been gracious enough to have had a job and the acceptance of the people for so many years. " Thirty two countries are looking to bring home a prestigious, 18 carat gold FIFA World Cup trophy, the highest honor in the world of fútbol, as soccer is known in Spanish. For the first game on Thursday, Russia will play against Saudi Arabia. How big is the World Cup for soccer fans? Huge. Cantor, who is originally from Argentina, knows all too well that for fans worldwide, and in particular fellow Latinos, the upcoming World Cup is more than must-see TV; it's truly a marathon of obsessive fandom. A recent Telemundo survey proves it. The survey found U.S. Latinos rated a World Cup win by their home country as the most important life event — second only to holding their own newborn child for the first time. A win by their team was more significant than a job promotion or winning a new car. Nine out of 10 Latino soccer fans said they planned to watch the month-long World Cup from beginning to end, according to the survey, and over half said they would rather spend a day hanging out with their favorite soccer team than with their own family. U.S. soccer fans have just heard great news — the U.S., Canada and Mexico won the right to co-host soccer's World Cup in 2026, according to the official announcement released Wednesday. The final game of the 2026 tournament will be held in Dallas, Los Angeles or the New York/New Jersey area. This just adds to the excitement for Thursday's opening game in Moscow. In preparation, Cantor said he has been watching a lot of the teams' videos and learning as much as possible about the players and their stories. What teams are looking poised for victory? When asked for his tournament favorites to win and which players to watch out for, Cantor did not hesitate to answer. “This World Cup will have great superstars like Lionel Messi, Cristiano Ronaldo and Neymar from Brazil, so obviously those are the three big names,” he said. He thinks Neymar and Brazil have a great team. "So I believe those are going to be the three main storylines of the World Cup that is filled with storylines," he said. Eight Latin American teams qualified for the World Cup: Argentina, Brazil, Colombia, Perú, Uruguay, Costa Rica, México, Panamá — giving U.S. Hispanics plenty of opportunities to cheer for their countries. The Germans are looking to win a back-to-back World Cup; they have several gold-medal winners returning. But some teams will make the German task difficult, including Argentina, a finalist in the last World Cup, who will be carried by their national hero and captain, Lionel Messi. The FC Barcelona star is looking to win his first major tournament with his country, as this may be his last chance before he retires from his beloved national team. An arm's length away, Brazil, Argentina's direct rival, is a favorite to win, according to many predictions. The Canarinhos, or 'Little Canaries'— a nickname coming from their bright yellow jerseys — have big names like Neymar, Coutinho, Marcelo, Casemiro, and Paulinho looking to bring back the glory days to their beloved homeland. Across the Atlantic pond, “La Roja”, Spain’s national team, is another strong favorite. With several gold-medal winners from the 2010 World Cup, including Sergio Ramos, Gerard Pique, Sergio Busquets, David Silva and their 2010 World Cup hero Andrés Iniesta are returning and fighting for redemption. But there are also dark horses that may surprise with wins, though each have some milestones to overcome. France is leaving several of the world's best players at home and has a roster full of talent, though they are younger and less experienced. Certain veterans like Antoine Griezmann and Paul Pogba can change games, and youngsters Kylian Mbappé and Ousmane Dembélé are looking to do the same. Over in Portugal, Cristiano Ronaldo may be playing at his last World Cup for his country. As he is in good form, captaining his country, he will be looking to see off Portugal under his own conditions. Perú had a dramatic return to the tournament; this South American country will be playing its first FIFA World Cup after a 36-year absence. After qualifying, Peru’s forward and all-time leading goalscorer, Paolo Guerrero,was handed a 12-month ban after testing positive for cocaine. After a long legal process, his ban in under an appeal process, granting the Peruvian permission to play in the tournament. With its leading goal scorer, and momentum back, the Peruvians may have a chance. Senegal, Croatia, Poland and Belgium all have big names as well, who may get the right opportunities to keep their countries in the tournament until the very end. Amid all the excitement, Cantor is ready to for his signature "GOOOALS!" "It's been an incredible ride for the last 30 years and I'm just looking forward to the next challenge," he said.